Think the cannabis industry is dominated by white business owners? It is, but perhaps not to the level many believe. A Marijuana Business Daily survey found that 19% of respondents who launched a cannabis business and/or have an ownership stake in a marijuana company are racial minorities. The survey, conducted Aug. 9-13, includes responses from 389 marijuana business owners and founders. The results are somewhat surprising, given the widely held perceptions that minorities in general have a minuscule presence in the industry. The survey data reflects the percentage of survey respondents who have any ownership stake in a business, not necessarily a controlling stake. For example, 20% of a business may be controlled by a racial minority, meaning the business has a minority owner but is not minority-owned. California has a massive influence on the marijuana industry, given that it accounts for almost a third of annual U.S. retail cannabis sales and has the largest number of MJ businesses in the country. It also has the highest concentration of minority-owned businesses in general, with some estimates putting this figure around 40%. Many marijuana businesses with minority owners also are clustered in the Golden State, having a significant impact on the overall percentage for the industry. To that end, 23% of the MJBizDaily survey respondents from California identified themselves as racial minorities. The survey allowed respondents to indicate their race from five major categories – white, Hispanic/Latino, African American/black, Asian and “other.” Nearly 7% of survey respondents identified as “other” when asked to indicate their race, the second-largest racial category in this survey. An increasing number of people do not identify with traditional definitions of race, a trend that’s playing out across the broader U.S. population. In accordance with U.S. Census Bureau methodology, respondents were given the option to identify as more than one race and therefore are included in each race selected. This means that each racial category is constituted by individuals that identify as either a single race or as multiple races. For example, just 50% of all Hispanic/Latino respondents in this survey identified solely as Hispanic/Latino. This leads to scenarios where – to an outside observer – an individual may not appear to be a racial minority, even though that individual identifies as such. The percentage of cannabis companies founded or run by minorities differs greatly by industry sector and business stage. Over half of respondents to this survey founded or have ownership stakes in ancillary marijuana businesses. These companies – such as marketing firms or law offices – don’t actually touch the plant and can get off the ground with relatively little capital and without the need to obtain a license. Furthermore, the stage each of these businesses are at runs the gamut, with some generating six-figure annual revenues while others have yet to secure their first client. Similar to the methodology used by the U.S. Census Bureau, an individual who identified as anything but white in the Marijuana Business Daily survey was classified as a racial minority. 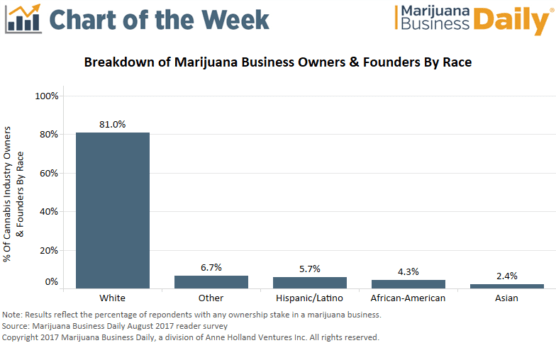 With 10% of cannabis business owners/founders identifying as Hispanic/Latino or African-American, these two racial groups account for more than half the businesses in the marijuana industry that were founded by or have minority owners. But Jesce Horton, co-founder and board chairman of the Minority Cannabis Business Association, thinks that when it comes to licensed marijuana businesses, the portion with minority owners may be much lower. “The biggest need and the biggest disparity and the biggest outrage has been the licensing process and the ability for small businesses to first get into the market, and then to survive after dealing with large taxes, huge licensing fees or all these other things that we fear are shaping up in opposition of minority entrepreneurship,” he said. It’s difficult, however, to assess how the rate of minority business ownership in the cannabis industry is faring relative to the broader U.S. business landscape. The two major surveys used to measure the percentage of minority-owned businesses in the United States – the 2012 Survey of Business Owners (SBO) and the 2015 Annual Survey of Entrepreneurs – differ considerably in how they report this statistic. For example, the SBO survey details the total number of the nation’s minority-owned businesses, while the Survey of Entrepreneurs takes a more narrow approach, reporting just the number of minority owned firms that have paid employees. According to the SBO survey, 29% of businesses in the United States are owned by minorities. The Survey of Entrepreneurs puts this figure at 18%. Given the nascent state of the marijuana industry – where many firms are still in the startup phase and may not even have paid staff members – neither metric is well-suited to draw comparisons to the U.S. economy at large. But rather than judge progress by the number of businesses in the cannabis industry owned by racial minorities, Horton believes what’s most important is the success of these businesses. Until California owners have a state-issued license they have not achieved a status that many would consider stable. Love to know the number of non-white excluding California. The statistic is disturbing considering the number of people of color who have been incarcerated because of possession of cannabis. As an African American botanist and cannabis entrepreneur, I am putting myself in position so that I too can benefit from this phenomenal emerging market called the cannabis industry. I have business plans for a production facility and a dispensary. More disturbing than the statistic is the lack of knowledge and interest of minorities in this huge opportunity. Im hoping to change the info void in the minority community and make sure that those who have the resources and skill can take advantage of the opportunity to improve their lives. My husband and I own a small legal grow in WA State and are African American. We are in contact with a very small, tiny community of African Americans in the field and would be interested in networking with other minorities in the industry. Feel free to pass this on to any businesses in the cannabis space you are keen to as well. You can learn more about Cannaculsive, here: http://cannaclusive.com. I appreciate your time. Thank you! Hi Lee…can you tell me what it takes to start up this business? My family is interested in looking into this. Thanks! Hello leon you have any YouTube videos about how start your own Marijuana business. It’s not legal in Ny state yet but the Governor is trying to push the Bill but Lawinforcment is fighting it. Keep in mind that California is a majority-minority state, so while 23% of CA’s legal cannabis businesses may be minority-owned, that is far below the proportion of people of color in the state. Totally misleading article. Use the number of business owners in REGULATED markets. California is NOT regulated yet so to use them in this analysis is erroneous at best. I love how these surveys about “minorities” completely obscure the well defined institutional racism that specifically targets black Americans, the original minorities, and builders of this country. Just like redlining in the 1950’s, the economic and legislative barriers to entry into the marijuana industry have been made so high that less than 1% of all marijuana businesses are owned by black descendants of slaves. However, black people are still being more criminalized for possession of marijuana than any other racial or ethnic group. Thanks, Bill Clinton. As far as I’m concerned any of this minority owned survey business is garbage. I don’t give a damn about white or brown Hispanics or any other group being in the marijuana business because these various so called minority groups had nothing to do with the government sanctioned human suffering and sacrifice that was used to create this country. I think its sick and typical nutjob thinking to be obsessed by who is in the pot business by race…. I suggest we boycott the NFL and NBA because its mostly black players… based on the theory of the above survey here, there is definitely massive racism in those sports leagues… forget ability, we have to go with RACE on everything. Gee… my words here must be privileged and therefore racist too otherwise why am I not bowing to the snowflake theory? You’re exactly right. What you said is very typical of a privileged person: missing the entire point, blowing the context of the entire article, and making this a victim of racism thing. No one said anything about boycotting the marijuana industry. No one said the industry is racist. This was to examine a large disparity which exists in the industry among business owners. I’m assuming you’re not a minority so, of course, you would be more apathetic to the lack of representation in the industry. Simply put, you don’t care because this doesn’t affect you. Typical and understandable individualism. But barriers to entry due to disparities in social and financial capital because of racially based policies that go back to slavery isn’t even slightly comparable to the NFL and NBA being dominated by black players and their “ability”. It’s not a sport, based on ability, it’s a billion dollar industry that minorities are being left out of. If you don’t see why this is of importance, why did you even read this article?